The extent to which Picasso was moving in toboth directions throughout this series is fascinating - I had sat down to sketch most of the bulls to figure out for myself the extent to which he kept reworking forms, shapes, masses and lines throughout the series. My first local art sale! The last one is the oldest, and I think that shows. - It's been on my living room wall for a while, and I'm looking forward to finding something else to replace it with - I was keen on putting something relatively small into the exhibition as well, and this one seemed to fit. I'm a big fan of good birthday celebrations - be it other people's or indeed my own. A few days back I realised that, with the first post written on June 26, it's today - September 26 - that this blog is three months old. When I started blogging, these first three months were mentioned again and again as the time span in which most blogs will falter and disappear. So, quite pleased with myself and this blog for keeping going - here's a happy birthday, with more proper birthdays hopefully coming up in due course. I treated myself and the sidebar to a new gagdet - a label cloud based on phydeaux 3's excellent instructions here. The cloud is fairly straightforward to create by editing the HTML template, and offers some good easy tweaks and customisation - e.g. colour, fontsize and most importantly, frequency of mention - mine is currently set to a minimum of two for the label to appear. I still have far too many single use labels to show them all. With the label cloud, searching the blog for particular items is much simpler than using the blogger search function. The cloud also shows easily the different topics discussed and their frequency. Eventually - and not before time, seeing that it was the last day of it - I managed to get across to Edinburgh to visit the Picasso on Paper exhibition at the Dean Gallery. Exhibiting over 140 paper-based works by the prolific artist, the exhibition provides an excellent insight into Picasso's draughtsmanship, his varied printmaking techniques and the innovation with which he approached media and subjects. The exhibition covers a wide span of his working life - from pastel drawings from the 1890s, the pre-war era cubist work, many etchings from the Vollard suite of the 193os, 1940s lithographs and some fabulous multi-coloured linocuts from the 1950s through to drawings and etchings from the last decade of his life. Many of the works are on loan from the Staatsgalerie Stuttgart, which holds an extensive collection of the artist's graphic work. I had taken my sketchbook with me - but once we were there I quickly suffered from a good dose of artist admiration (which isn't quite the word but you hopefully get was I mean), but took out the sketchbook out to do a number of quick shadow shapes sketches. I enjoyed the sense of artistic and technical development coming through his works - exploring different type of print techniques, mixing them up (e.g. by scraping on lithographs), and while my understanding of print techniques isn't good, I found Picasso's continuous search for something different, stretching the boundaries of what is known, done and understood fascinating. Let me illustrate with an example from his cubist work - daily meetings with George Braque led to an exploration of collages and geometric minimalism - how little information is needed to denote a sketch as a human head? Described by Brigitte Leal, in The Ultimate Picasso, as 'papier colle revolution', Braque's interest in materials was taken up by Picasso throughout 1912 and 1913. 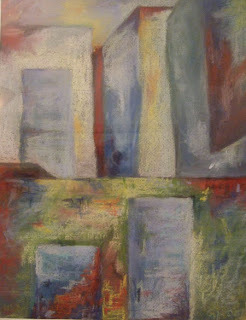 Here painting and collage influenced each other mutually. the form no longer depends on a drawn or painted structure; papier colle has taken its space. Cutouts and assemblages alone define the spatial composition. 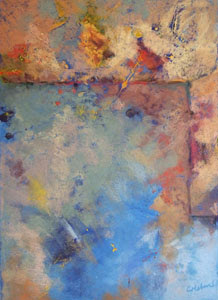 Here color 'working simultaneously with form,' Braque put it, takes priority, disrupts the two-dimensionality of space. The painter is playing with the ambigous nature of the clues: the same triangular bases for both, the same bands of black and blue glued paper to stabilize the forms without mimicking the subjects, and the use of the double curve that usually evokes the guitar to form the head. 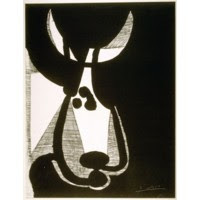 There's more to follow on this one - notably Picasso's process of abstraction through a series of lithographs. ... dodging the promised painting tutorial, I've been looking for interesting new blogs and in the process came across blogthings.com - a site full of funny, pointless and cute little quizzes. One of them reminded me of a discussion I had with a friend a few days back. I was mourning the disappearance of summer (which at least here never really was at all - and that is even accounting for the general lack of summer in West Central Scotland) - she insisted that I was an autumn person in any case, so I should look forward to the coming months. Quite funny, these classifications, aren't they? To be honest, I would have trouble identifying my favourite season - I usually find that once it's time, I usually enjoy it and find plenty good stuff whenever - be it spring, summer, autumn (maybe in wet, windy winters less so). In relation to art, I've been thinking about different colour palettes for different times, seasons and places - how it took me time to get a sense of the desert in spring palette and more recently the outdoor painting in Scottish summers. Here, the freshness of spring contrasts nicely with the rich red-orange-greens of autumn, late summers. I've also picked up on how the sky is changing in hue and 'feel' as the year moves on. Which carnival ride are you? And, not to forget: a quick way to discover your hidden talent. The initial starting point to the previous post on blogging styles was how people stumble across my blog - and that many do so by looking for advice on 'how to paint in pastel'. When I started yesterday's post, I had initially planned to write more about learning styles and different ways to learn. Or, more appropriately (and rather selfishly): how I seem to learn. It seems to me that I'm distinctively learning in a way that Scots would express as 'fae arse tae elbow' - from back to front. Well, probably not quite back to front but from trying out first and then seeing all the things that don't work. So, for my cloud studies I looked rather quickly around to some (drawing) demonstrations but then just went ahead and tried to get to what I'd see. 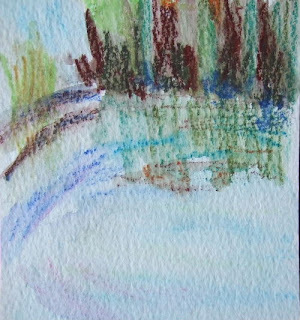 I did many of them in the water-soluble Neopastels - which work very similar to watercolour pencils, and which as such are very different to the other media (notably pastel and oil) that I normally use. Namely, and that only dawned on my in study #20 or so - I didn't have a clue how to get whites into watercolours - whereas with pastels, oil or acrylics one can add easily light/opaque hues, in watercolours these need to be preplanned as it's often the white of the support that is being left exposed rather than an actual medium added. Over the past couple of months I did compile quite a few bits and pieces of reference material - including painting demos, sketches of artists such as William Turner or John Constable, contemporary artists etc. But I did so rather unsystematically - somehow just knowing that they were there for me to look at seemed almost be enough. Here, the working in series - be it the sky studies or my more abstract work does go a fair bit towards trying out and observing what happens - to set the task for the next study, or indeed for the next five to explore more systematically problems such as composition, colour, technique, mark-making or similar. Similarly, I like reading about and looking at other people's art - but many instructions and how to articles or books quite quickly get lost on me whereas some works stay with me and I keep going back to them. For instance one of my earliest posts on Sarah Bee's largely pastel-based mixed media work on rock faces, undergrowth and pine woods. 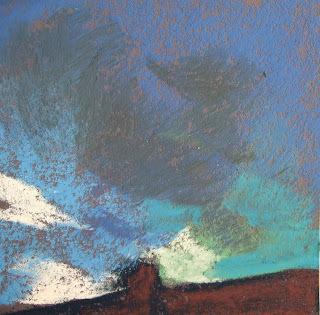 The painting at the top, by the way, was my first explicit skyscape. I hope I haven't posted it before, but it was the second of the Bedrock & Clouds series and with the unusual cloud formation being the initial inspiration, it was a good lesson in learning how, in order to close and finish a painting, one needs to let go of some of the initial inspiration (so many of the the other Bedrock & Clouds don't actually have any clouds in them :)). It currently still hangs in my office - but since yesterday with an imaginary red dot - which made my day, especially since Etsy is still rather slow. I am still in surveillance mode - seeing that a fair part of visitors to my blog come to it by looking for painting instructions - like how to paint in pastel? how to paint clouds/skies? Etc. Yet - not many of them stay very long on the site. There are plenty of sites which are in a much better position to offer painting instructions and demonstrations - many of them are on the excellent WetCanvas! forum and its many subject and medium specific subforums. When I started blogging, the main motivation really lay in a rather selfish wish to create a series of personal prompts to keep working with my artwork and to keep developing it. Quite quickly the interactive abilities of a quickly changing, expanding and communicating website became an important addition - reading other people's blogs, finding out about their work process, ideas and change has proved an important source to move on my own thoughts, ideas and work process. One of the golden rules of blogging is that ‘content is king’. All the articles about improving your readership numbers will tell you to ‘write great content’ and ‘post regularly’. But how do you do that? Where to start? It can all seem a little daunting at first. Kirsty lists eight different blog styles and gives a numer of links as examples. These styles range from the blog as art, via tutorial and process blogs to news and opinion blogs. Not surprisingly, I felt that in different posts Paint & Pastel fits into different categories at different times. Much easier than identifying what this blog resembles is to see what it doesn't do - it doesn't intend to be a piece of art in its own right, nor does it post many artworks without commentary. As said above, there's too little on actual instruction to qualify for a tutorial-based blog. I quite happily concede these points and don't feel too disappointed for not belonging into those. Similarly, the blog doesn't cover extensive news of the art world to make it a news blog. 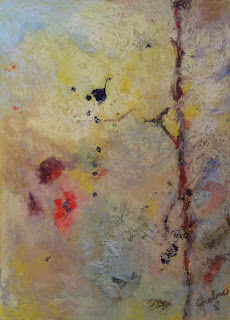 The subject blog - Paint & Pastel in itself as a title makes the subject and appropriate content of the blog rather wide and not narrowly focussed on one subject. My intention to write on my art and work process is a subject in the sense that I'm trying to leave much other things outside the blog, but they do, of course, come in at one point or another. Reading the post by Kirsty, and some of the more recent ones where she follows up the importance of a web-based strategy for artist has offered some insights into my own views and motivations on blogging - but also provides some routes that could be pursued if I'd like to move towards other styles and develop the blog. Most attractive for that is a stronger article-based style. Continuing to get organised online, I have uploaded more photos to my flickr account. I had slowly started to place some of my landscape reference photos into the first set. And only recently I begun to upload some of my small artworks, too. So, now I have an account with unlimited sets to create, groups to participate in and photos to upload. They are the flickr accounts of some of the Etsy sellers I have come across recently, and while I've always liked photography not merely as a means of recording but as artwork, it is when I saw the vast collections of some people that I was reminded of the power of photography and the visible in general. Both of them have made it very quickly onto my favourite items list in etsy - Tara has the cutest paper creations, and Susannah's photography of beach huts, dunes and the South English seaside had me dreaming of a beach holiday. 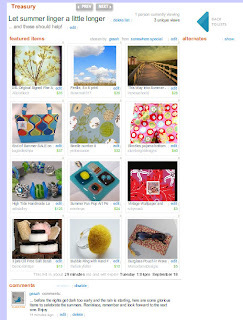 ... the fruits of my hours in front of the computer today has been a Treasury at Etsy. These treasuries are curated lists of handpicked items on any one theme - but timing is crucial as it is only for a few seconds, when the number of treasuries drop below a certain threshold, that you are able to create one. I feel that this blog is going quickly the same way... if you drop by here often you surely will have noticed how the sidebar is quickly cluttering up with assorted new items. In particular the geotagging of the world map made my geographer's heart jump up in joy... and that was nonewithstanding of all the things that I know are wrong with equating people with where they are from (how often was I frustrated to being reduced to being someone's 'my German friend' LOL). But I've nonetheless been examining excitedly the map day by day to see if somebody new would pop up - in particular from those more exotic locations like Saudi Arabia, Hawaii and the middle of the Australian outback. But also (and again my professional heart was put to contented rest), of course, these maps are gloriously inaccurate - first of all, many people never map onto them, but secondly, my mum would show up from anywhere across Germany (Hallo Jutti!! ), similarly my friend in Israel from anywhere between Haifa and Jerusalem (I initially I did think my tagging for Israel, desert and Anna Ticho accounted for all those many Israelian hits, again LOL). It's all good fun to pass the day (sorry: I mean evening, of course) nonetheless. And an interesting aside has been that I've become much more confident with what any internet technology can do - just look at those photo lists on Flickr or the link to my Etsy shop, and I'm still fascinated how a couple of lines of words and numbers make the computer go elsewhere when you click here. - In the early 1990s I took some of the first computing classes in my school (in fact: the first girl to do so, if I remember) - but keeping in line with the gender stereotypes, I still have to write to this day a programme that actually does what I want it to do - just as well that html tags have got so much more easy. But to end with something closer to paintings - I've started to put some of my reference photos onto a public site at flickr - they are largely landscapes, sky and cloud references so far - trying to keep a reference base for some of the sketches and studies I've been working on. In so doing, I am then, yet again, pleasing my utterly unmodernist self - filling, extending and cluttering to my heart's content. ... which I meant to post much closer to my jam experiments. Bake them for 12-14 mins. ... my favourite way to spend the evenings seems to be getting thoroughly lost in cyberspace art worlds these days. I somehow feel similar to when I first discovered the internet 10 years ago: where have all the hours gone??? I've been spending more time with my Etsy shop and trying to find some way around the vastness that makes up Etsy. Etsy seller organise themselves in various street team - to promote their work (e.g. beadwork, or by locality) and to provide a more friendly and personal face to the thousands of shops and their artworks. One team where I liked many of the members artworks calls itself VAST (see the pun ;)) - the Visual Artists Street Team. After joining them, my blogger dashboard - the interface software with which all these informative blog entries are written and posted - has doubled in size as I can now decide to which blog I will contribute. - Just need to remember to keep checking for which blog I'm creating posts now. I am excited in the sense that some of the web 2.0 technology just opens up so many possibilities of communication, and a group communication via a team blog seems just like one of the good ones. - And one which makes you easily forget some of the more tedious asides of all this internetting. I'm still moving far too slowly for my liking to some more abstract and bigger works. I seem to be stuck on small, small, small paintings for the time being and am looking forward to having access to my Saturday studio space/workshop from October onwards again. I've been using the watersoluble crayons and waterbrush again, though I'm a bit unsatisfied with the 'straightness' of the colours for what I was after. Again, a matter of experimentation and trying out which medium works best for. 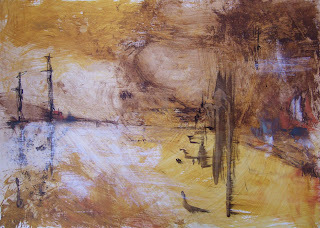 It'll be acrylics later on this afternoon, but here's the set of three dessemblages from the shoreline painting first. I've uploaded some more small pieces to the Etsy shop. Both etsy and ebay feature many small-sized original pieces. The format that is particular popular is that of traditional playing cards - 2.5"x3.5". 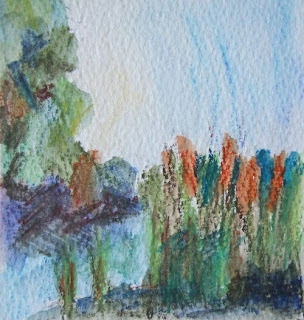 As Art Cards, Edition and Originals (short ACEO) or Art Trading Cards (ATC), these small works are proving popular as a highly collectible yet inexpensive entry point for people to start buying original art. 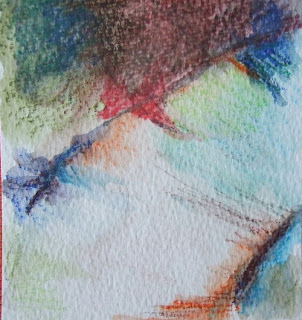 I have been doing some ACEOs at various points - both for my sky studies but also as a way of exploring composition, lines and values in potential larger paintings. Now, I've uploaded some of my earlier ones which are of the rooflines, chimneys, angles and tiles of the tenement block opposite mine. These are done in ink on watercolour paper - if you look at them as a set, you can trace the increasing abstraction of a similar subject: lines and marks have become more and more sparse and in the third one the chimney and its shadow shape is only alluded to. I went to a music festival for the weekend - it took place in a beautiful part of Argyll, so for the landscape and for the people I took my sketchbook along. Yet, with it larger than my bag (note to self: get a smaller sketchbook when there is really no space extra) I left it at the place where we stayed. Sketching all those people would have been a real challenge for me - with some life drawing I can get to grips with more detailed anatomy but the generic 'masses of people in a distance' way of sketching still evades me. So, there's something else to add to my to do list: look up and find out how to do figures in groups, distance and in a general way. Another visual arts-related observation concerned the sense of vibrancy and movement. How do you capture and (re-)present people moving, music in the air and vibrancy? I don't mean drawing people simply with their arms in the air or one foot off the ground but other ways of getting that sense of movement. 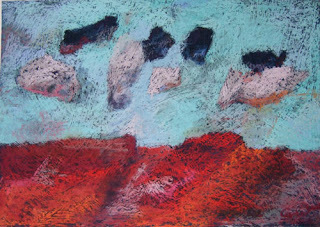 I tried to get to this sense with one of the desert paintings - the Spring in the Sky one here - where my initial impulse came from a drive through the desert on the way to Tel Aviv airport and one hill after another buzzing by - yet, if you look at the resulting study, it is as static as can be: it ended up being about spring colours in the desert and there no sense of movement whatsoever. 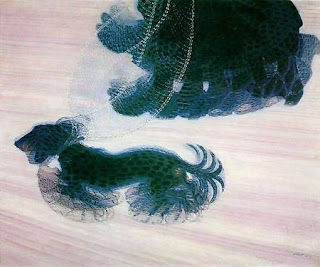 Of course, the Italian futurist movement in the early 19th century, most notably Giocomo Balla's Dog on a leash, explored modernity through dynamic movement. I think I need another round of finding some information not only on the Futurists but also other ways of depicting and capturing movement. A website I just came across in my search for Balla was the art education site Art in Motion - Capturing movement in art - initially targeting secondary school children, it offers a good starting point to the study of movement and the various ways to capture it in sculpture, painting and drawing.